List of World Champions Grand Prix motorcycle racing, from 1949 to 2005, in order of year and engine displacement. 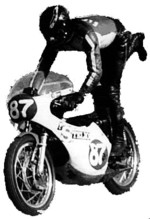 The following is a list of Grand Prix motorcycle racing FIM World Champions, from 1949 to 2007, in order of year and engine displacement. At the end of the 1968 season, the FIM limited gearboxes to 6 speeds, 125 cc and 250 cc categories to no more than two cylinders and 350 cc and 500 cc categories to no more than four cylinders. The 350 class was discontinued after the 1982 season. After the 1983 season, the 50 cc class was increased to 80 cc. After the 1989 season, 125 cc bikes were limited to single cylinder engines and the 80 cc class was discontinued. Sidecars had 500 cc engines. Only the pilot is listed here, not the passenger. The significance of this class dropped after the 1950s, but races were held in connection with WC until the early 2000s. The Manufacturers' World Championship classification is based on the Riders' Championship point system: only the highest placed motorcycle of a manufacturer will gain points, according to the position in the race. John Surtees remains the only rider to win World Championship titles in 350 cc, 500 cc, and Formula One (1964). Valentino Rossi is the only rider to win four World Championship titles in four different classes: 125 cc, 250 cc, 500 cc & MotoGP. Eddie Lawson (1988 & 1989) and Valentino Rossi (2003 & 2004) are the only riders to win back-to-back premier-class championships on different manufacturers. Freddie Spencer (1985), Tetsuya Harada (1993), Manuel Poggiali (2003), and Daniel Pedrosa (2004) are the only riders to win the 250 cc Grand Prix World Championship title in their first year of competition. In 1990, Capirossi won the 125 cc title in his first attempt.